A Southern Grace: turtles? really? Yes, I know certain regions of the world find actual turtles to be a yummy soup meat, but I have zero interest in consuming the critters. Why? I think it's because I feel sorry for them--anything that moves that slowly deserves at least a little bit of sympathy. Am I the only one who's tempted to stop the car and help a turtle cross the road when I drive up to one? Eh, maybe I am. Moving on. These bars do not contain real turtle, and they are delicious. I'm pretty sure a layer of thick, chocolate-shmeared and pecan-studded caramel atop a shortbread crust is the definition of decadence. The name 'divinity' must've already been taken by those meringue-y candies at that point. Too bad. Preheat the oven to 350°F. Combine the crust ingredients in food processor or mixer and whirr until the mixture resembles fine crumbs. Press onto the bottom of an ungreased 13x9-inch baking pan. Combine butter, brown sugar, and salt in a saucepan. Cook over medium heat, stirring constantly, until the entire surface of the mixture begins to boil. Boil 1 minute, stirring constantly. Pour evenly over crust. Bake for 18 to 22 minutes or until entire caramel layer is bubbly, being careful not to overbake. Remove from the oven and immediately sprinkle with chocolate chips; allow to melt slightly (2 to 3 minutes). Swirl the chips leaving some whole for a marbled effect. Sprinkle the chopped pecans over the chocolate and press in slightly. Cool completely; cut into bars. This reminds me of an English tiffin recipe. Great combination! I heart bars! What a droolworthy treat. Chocolatey- Caramelly bars??? I'm in. YUM! I always stop and help turtles cross the road. I thought I was the only one! Those look incredible! Turtles are way to cute to be eaten. I've never really understood the whole turtle thing either. Someone must have been high when they came up with it. They would have a difficult time making it through the week at my place. My hips would never get over it either. Oh would my mom ever love these! I love turtles. I'm really glad I don't have any caramel in my house, or I'd be starting a batch of these right now. And ever since a big ol' snapping turtle ate our duck, I've not been such a fan of the animal turtle. Yum? These are so classically comforting and delicious. Nice job. Ha! You are funny, as always. Despite the name, these bars indeed look divine. No doubt these turtles are delicious. This is one of my favorite combinations for something sweet. Can we think that they are called turtles because they are best enjoyed slow? Nah. Just in time for February...chocolate month! Yep, I always wondered about the name :) These look so scrumptious, yum! Lol, good question...I wonder how they got their name! I love them no matter what they're called...and yours look fantastic! i can't tell you how many lil critters i help across the road and send them in a safer direction each and every summer. grace just be a good girl and send these my way? ok. The combination of chocolate, caramel, and pecans is hands-down my favorite thing in the world. These are perfection, and now I'm very jealous that I don't have some siting in front of me at this moment! yes please! I'd probably eat all of the crust before it got into the pan. or maybe just dunk the crust into melted chocolate? Yum! Well....I know they are called turtles because originally, pecans stuck out like little turtle legs. Your bars, however, feet or no feet, are absolutely perfect. Can't beat a combo of pecans, caramel and chocolate. Especially the caramel part. Turtle or no turtle these look pretty darn tasty to me! I absolutely love the combination of chocolate, caramel, and pecans. Mmm...I do love turtles. (But I only eat the chocolate kind.) I'm also one of those people who'll stop to take a turtle to the other side of the road. I've heard that you're always supposed to take them to the side where they're headed, or they'll go right back again. 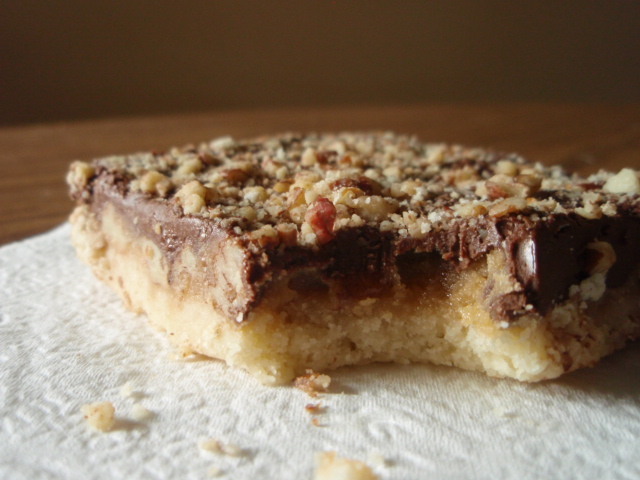 These turtle bars look absolutely scrumptious, pecan feet or not! I have never understood the turtle name either. I've never had a turtle bar Grace but they sure sound decadent. The closest I've come was at a restaurant a long, long, long time ago, and it was called a chocolate malted turtle, can't remember much about it but I think brownie, ice-cream, choc and caramel sauce was involved. I'd eat those turtle bars though! They look terrific! When I first heard and American friend talk about 'turtles' I assumed they were turtle shaped chocolates (like a Guylian seashell but, you know, turtle shaped). Anyway, now I have shown my silliness, I shall have to make these lovely treats! Turtles did het their name from the chocolate treat that comes from a box. They look like turtles with their pecan legs but are so much more delicious. I have been known to eat an entire box so would have a hard time stopping at one slice of your bar. Turtles is a strange name for such a wondelful treat. I am loving these bars! I am afraid that I would eat the whole pan and not share any with my family. Yes, turtle doesen't do these bars justice at all. I've always wondered why such a name! But your turtle bars are calling my name for sure Grace. I must make these! Not only have I stopped to help turtles, but on one occasion we stopped to help a small snake that was lost in the asphalt jungle. 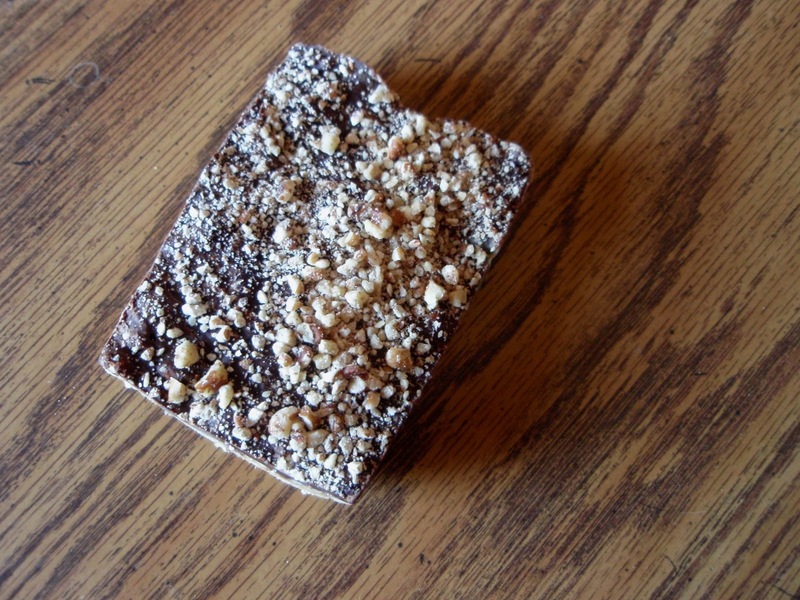 That aside your turtle bars are a perfect treat. Hahah you're most certainly right and I never found the name particularly appealing. Though it does recall a fond memory for me of the first time my grandparents visited us from China and brought home a turtle they found by the road that they wanted to stew for dinner... You may be relieved to hear we made them set it free ;). Man, I really want to eat chocolate right now. But you have seen the dollop of chocolate with the pecans making the legs, right? Turtle? They do look like turtles :) Your bars, on the other hand, remind me of the English Toffee I gobbled down this past weekend. I'm thinking that makes these turtle less turtle bars perfect. Try saying that 3 times fast. I love turtles.... This just looks toothsome. Ha! Your post made me laugh. Your turtle-free turtle bars sound amazing. whatever their name is they are very hard to resist, actually impossible. I am crazy about pecans too, and the combo with chocolate. .wow!!! Too funny. I've been reading about medieval cuisine ... and yes, they did actually did ... eat ... turtles. Glad to see there aren't any in your bars. I'm not so sure they'd enhance the shortbread. ;) They look scrumptious, as always! I have helped a few turtles cross the road in my day..stopping 5 lanes of traffic. I am sure people were not pleased with my humanitarian efforts towards the poor turtle in rush hour traffic. But I sure do love the eat the candy variety! The combination of chocolate, caramel and pecans does not make something a "turtle". A "turtle" is a candy that is made to look like a turtle. It is made by first laying down pecans, then laying some caramel on top of that and then finally chocolate on top of that. (picture of them are all over the internet).The pecans are put down in a way on the bottom that they end up looking like the turtle's feet. If they are made correctly, they do look like turtles. And they are delicious. Oh, how I wish I had a plate of these delights right now. Delicious treat, Grace. Wanted to say thanks for the good wishes sent out to my sister and her family. The support means a lot. Oh my I would love one of these right now!! I feel guilty by just looking at this! I love any sweet with turtle in the name and these are no exception - YUM! the original candy concotion really does look like a turtle. what you have there is not the original. its not original, but it looks yummy anyway. Would love to your version! Love the combo! !1 I am craving sweet lately....Printing this one! I've never heard of this stuff - but I think some nice chunky pecans are exactly what millionaire's shortbread needs! My aunt's dam currently contains a turtle that had been crossing the road. A kind woman stopped the car, picked it up and knew my aunt would give it sanctuary. Apparently they smell very, very bad! I too am a turtle saver. Once when I was lost in the hills of Kentucky, I had to bypass what appeared to be millions of little turtles migrating across the road. I guess that's why there was a Turtle Crossing sign in big letters a few miles ahead, lol. As for naming these tasty treat, the only thing I can think of is when you use pecan halves and the chocolate peeks through it sorta kinda looks like a turtles back. Of course the caramel helps! LOL what a weird name! I just found your blog and I'm really pleased because you've got great recipe. This one would be delicious! What great texture contrasts too. I just had these yesterday at a tennis match! They are wonderful! I am making these in the near future. There are pecans in the crust?!? Well, I'm convinced right from the start that I'll love them! Turtles are my all-time favourite chocolates, so a dessert bar has to be incredible. I like how easy them seem to make too. Those look amazaingly scrumptious!! The photograhy is equally amazing! Great site! I am pleased that no turtles were harmed in the making of these delicious bars. I also save turtles in the street. These turtle-free turtle bars look amazing. Now I'm hungry! I like turtles too. I feel sorry for them but I also think they are cool. I mean, they have survived! I also like the sound of these turtle-less turtle bars. Yes - I think I'll go for the turtle-free kind as well!! I just found your blog and I am a new follower. This recipe looks amazing! I can't wait to try it. I totally help turtles across the road! Except that one time when I tried to help a larger turtle and almost lost a digit. Darn snapper, I was just trying to help you!! hehe, turtle-free turtle bars - good to know! I love turtles too :) I've never hear of these though! I love your Blog but the pounds the pounds! But there again life's for enjoying, its not a rehearsal. I just hit print on my computer, these look so good!